Here there be ... Yets! Well, let's just say that he's acquired a newfound mastery of his craft and leave it at that. And the best part is that, once you've taken Bocianowski's enthusiasm and commitment to the title into account, it's quite obvious that we ain't seen nothing yet. Bill Baker: OK, I'll bite: What's a Yets? Mike Bocianowski: Yets are wondrous, magical and sometimes silly creatures that have a name that only the Yet can pronounce, so for us they have no name .... as of Yet. Humans used to call them Dragons but that term is considered insulting to the Yets. BB: What can you tell us about the main characters, and what kind of world do they inhabit? Sir Perry - He is an adventurer with the senses of Allan Quartermain, the intellect (and hat) of Indiana Jones, the skills of Bruce Willis in Die Hard, but Perry is a fuzzy Guinea Pig. Spec - He is Perry's first mate and loyal friend. Spec is your basic cuddlemutt. Spec claims he is a Chihuahua, but everyone knows that he is adopted by Chihuahuas. The "baby" Yet - This is the little red, horned creature on issue number one. It started the whole story when it fell into Perry's and Spec's lives and Perry and Spec decided to return it to it's home. The world they inhabit is The Giant Sagacious Oak Tree that floats in another galaxy. This tree is huge, the trunk is the size of a small planet. The story is that Humans and the Yets/Dragons used to live together,but a world war called "The Great Argument" developed between them. Rather than see their world destroyed, the humans and the Yets signed a treaty and the Yets are consigned to live on a reservation (The Knot Yet City) in the Sagacious Oak while the men live on the ground. That happened so long ago that by the time our stories take place, both races have developed many myths about each other. I'm going to tackle the answers to why this happened, and what humans and animals think about the Yets in the first three issues. Also you will meet Vance, a Yet who guides/teaches Perry about the Yet life, and you will meet Princess Peggy Stargazer, Perry's wife, and I will put a world map in issue two. BB: Where'd the idea for the series come from, how long did it take to develop into the series we're seeing today, and what kinds of trials did that process entail? BB: The idea really formed organically. I was using the little baby Yet in my other series, Chuck the Ugly American. 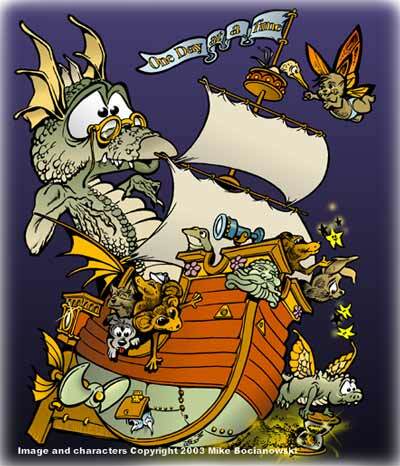 Also, I was selling a print with Dragons and cute animals flying in a boat. One day George Broderick Jr. mentioned, "Gee, I'd like to see ya' do a story about that print!" So I started working one up. I found an old library book about myths. The book talked about the myths of the Norse Yggdrasill and the Yiddish Chelm, so when nobody was looking I took the myths, put them in my pocket, smuggled them out of the library, and incorporated them into Yets! That was during the Spring of 2002. It seems like this series came together very easily once all the pieces are there. This world of the Yets was just waiting (in limbo?) for somebody to come along at the right time to tell their story. BB: How does a typical issue of Yets get built? Do you work from a script that you've created beforehand, from a loose plot, or do you just sit down and basically "wing it" on the blank page? MB: I work very methodically ... at first. I write a paragraph synopsis of the issue, then I plan the page breakdowns with dialogue and (literally) thumbnails of the panel layouts. I write everything in longhand with a pencil and a spiral bound notebook, jotting down notes as I go. Then I mark out the panels on all my art boards, and start penciling, while I keep my notebook right at the top of my drawing board. I should note too that while I'm thinking of synopses I'm also doing pre-production drawings in my sketchbook, just like they do in the animation business. Here I try to design characters and environments so this world will have believability, personality, attitude, and appeal. Now it's a matter of inking the art boards, scanning them in, lettering them, putting in grey shading, and even here I might tweak the dialogue or add humorous details. At this point I am also working on a cover as well. The nice thing about working on a series is that while I might be inking one issue, I might think of synopses for other issues and jot them down. Then I can return to the synopses days later when I'm done inking and review them with a fresh eye. I've learned the basic methods from other professionals in the field, but I still enjoy hopping back and forth between each step. BB: How long do you see yourself working on this series? Is this a book you could easily work on for years and years and never get tired of doing it or run out of ideas to explore in it, or does it have a definite beginning, middle and end? MB: I want to work on this book forever. I feel there is a whole world to explore and characters' lives to develop. I don't want to end at 300 issues or just complete the end of a story arc. I'd like to design each issue so you can pick it up and read it without needing the previous issues. If I can't afford to keep publishing, then I'll publish art prints; if I can't afford to publish prints, then I'll still sell sculptures and t-shirts; if I can't afford to do that I'll still draw things for my nieces, nephews, and friends. 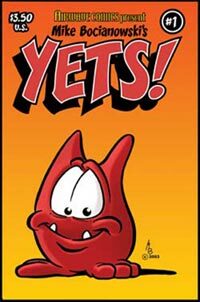 I can't stop, the Yets are a part of me just like Chuck the Ugly American is. BB: What do you get from doing Yets!, and from creating comics and art, generally? MB: Relief! [General laughter] ... and joy. This is an outlet for my ideas, otherwise the ideas just get lodged and build up in the fatty tissue of my brain. BB: What do you hope readers get from your work? I hope you get as much joy from the Yets! as I do creating it. I think our whole world needs more joy, and love ... things like that. BB: Anything else you'd like to add, like where folks can buy Yets! if there's no story around ... or perhaps something you'd like to get off your chest, like complaints about the price of gas? MB: Well, you mentioned complaining about the price of gas, so that's out. With luck, my publisher Airwave comics will get issues # 2 and # 3 out bi-monthly in Previews starting in January, after that I will be looking for a publisher or self publishing new issues at the end of 2004. 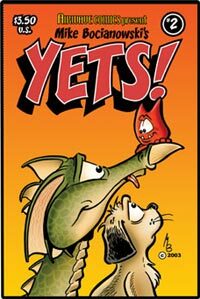 You can get all the back issues of Yets!, all the limited edition prints, t-shirts, and now I have a line of cast sculptures of the characters -- so you too can have a "Pet Yet"! -- on my website: www.artistmb.com. I also post news, and pre-production sketches there as well, and as I say in my books, "Yets are lonely creatures, so feel free to email or write them with your comments." You can still order the second issue of Yets! , which you'll find on page 202 of the January, '04, edition of Diamond Comics Previews. Or, as Mike mentioned above, you can always order the book directly from him via www.artistmb.com.